The Belize Barrier-Reef Reserve System is a series of coral reefs straddling the coast of Belize, roughly 300 m (0.2 mile) offshore in the north and 40 km (25 mile) in the south. It extends for about 300 km (185 miles), making it the second largest coral reef system in the world after the Great Barrier Reef in Australia. I have visited Belize and its barrier Reef a few times for scuba trips, and its definitely worth a visit. It is less touristy then nearby Mexico, yet has some amazing diving. During the right season you can see whale sharks in the south, and I saw a few white tip sharks in the Blue Hole as well. You have to be careful what dive center you go with, as many in Belize have a bad reputation for being too lax with the rules or dive safety. Another fun thing to do with your dive operator is the now popular lion fish hunts. They give you little Hawaiian style spear guns, and you get to shoot this invasive species all day. Pretty fun and helps the environment. I went to Belize in the summer of 2005. Belize's reef is fantastic. I am a PADI diver, and I went with my family. The water is so clear-clearer than the water in Cozumel. Much of the wildlife we saw was diverse and exotic, a big hit with us. The Blue Hole experience was worth the whole trip. You cannot dive in Belize without going there. Our group (Amigos Del Mar-amigosdive.com) took us on a 2-story boat on a day trip to go to the spot. Getting there was a bit rough-you have to go on the open sea for a few hours, but it would have been much worse had we gone in a smaller boat with less people. We stopped for lunch at a spectacular snorkeling island (no diving, we had to wait for the hole). So, some of the people we went with just snorkeled and didn't dive. When we got to the spot, it looked terrific. Pictures don't do it justice. So, we dove off the side and dove to a depth of 120 feet. It was cold (wetsuits were recommended) and dark. After about 60 feet, the water got very hazy. Looking down, all I saw was abyss. Its a strange feeling. About halfway through the dive, our boat started throwing chum over the side to summon the sharks at the bottom of the hole, so we saw the sharks rise quite near to us (30 feet). After we got back onto the boat, we drove back. Something rare happened to us on our journey back. We spotted a school of dolphins, and they were swimming alongside the boat. Naturally, we stopped and everyone went snorkeling. We all swam with the dolphins for a few minutes. The reef was a once in a lifetime experience for me and my family. The Belize barrier reef is one of a small group of natural sites where we have visited the “natural phenomenon” but have not actually entered the detailed boundaries delineated by the nomination (limited in this case to 7 relatively small reserves from an overall reef length of almost 300kms). This was largely because we visited it in 1985 ten years before its inscription. Now it may be that the sea is much bluer, the fish much finer and the coral much more spectacular within the boundaries!! But we are not great snorkelers and don’t dive at all so some of the attractions such as the “Blue Hole” would not have been directly accessible to us. So what was it like? It is one of those useless travel-related “trivia” that the Belize reef is the “second biggest barrier reef in the world” (After the “Great Barrier Reef”)! However in geological terms it is quite special:- “Belize also has one of the most diverse reef ecosystems in the world, with all the main types of reef represented: fringing reefs along the mainland coast; the Barrier Reef itself which grows along the edge of the continental shelf, separated from the mainland by the lagoon; and three offshore atolls …. The presence of atolls is unusual. Most atolls are found in the Pacific, where they form on the top of submerged volcanoes. 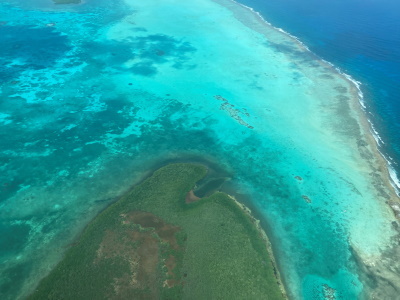 Very few occur in the Caribbean, and they differ in structure, the three in Belize for example lying on non-volcanic submarine ridges” (Sue Wells, UNDP/GEF Coastal Zone Management Project, Belize). We certainly saw some attractive marine life when we snorkelled there but I couldn’t comment on how it ranks among the world’s marine destinations. We are happy with what we saw of the reef and enjoyed Belize as a destination, but see no need to return for more, even “inside” the boundaries. However there must also be some doubt about what we would actually see now. To quote from http://news.bbc.co.uk/2/hi/science/nature/5064870.stm “Scientists in Belize ….. say the 297km (185 mile) reef here has suffered more than 40% damage since 1998”. As for not actually having entered the WHS, I doubt if St Peter will be quizzing me on my visit and I regard WHS “collection” as a hook to hang travel experiences on rather than as a “moral issue”! As for Belize itself as a destination, Aldous Huxley wrote of if “If the world had any ends British Honduras would certainly be one of them”. This was back in 1934 and there are certainly many more deserving candidates nowadays but it gives a feel for the laid back atmosphere of the place. Another possibly unfair quotation is one by Norman Lewis in 1959 who said that “One of the first things that strike the newcomer to Belize who has seen anything of life in the West Indies is the mysterious absence of anything that might come under the heading of having a good time”. Indeed it may not be Trinidad with its Carnival, but the contrast between the lively Caribbean-based culture of Belize and the quieter Amerindian indigeno culture of Guatemala just a few miles away is very noticeable. We experienced it when we entered Belize overland from Tikal. From Belize City we got out to the reef at Caye Caulker on one of the frequent water taxis (around 45 minutes journey). This island (actually split in 2) is situated in the northern section of the reef but south of the main tourist resort on Ambergris Caye. Tourism here is very much “locals based” and we stayed in a fisherman’s house right on the beach. As we didn’t have an underwater camera the only photo we have of the reef is from this guest house out to the breakers about a mile away on the horizon looking over the boat we hired to take us out. Although designated as “Caye Caulker Marine Reserve” the reef here was not included as part of the WHS. The IUCN evaluation indicates that it is possible to hire boats from Caye Caulker to visit designated parts of the reef - Amergris Caye might however be better for such services? Bureau - Integrity not ensured - boundaries to be changed including adding "Blue hole"
Marine sites: Total inscribed area 96000h. The only "terrestrial areas" are reefs since island areas along the reef have been excluded.